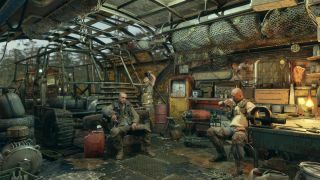 The Metro series has never been one to skimp on the graphics, and with the announcement of the Metro Exodus system requirements, we now know what we’ll need to play the post-apocalyptic shooter at its most fetching. The answer, unfortunately, is an RTX 2080 Ti. Check out the requirements for minimum, recommended, high and extreme below. Even for the high settings, you’re looking at fairly beefy requirements. The recommended setting are also higher than you might expect compared to other upcoming games, like Anthem, or recent games like Resident Evil 2 and Monster: Hunter World. They’re all pretty flashy, but each recommends a GTX 1060 or equivalent, while Metro Exodus requires a 1070. If you want to enjoy Metro Exodus’ ray tracing—essentially very fancy lighting—you’ll need to have one of the new RTX cards. Developer 4A will be releasing performance profiles for RTX cards soon. So! What can you expect if you meet these requirements? At minimum and recommended, you should be able to run the game at 1080p with an average framerate of 30fps and 60fps, respectively. If you hit the high requirements, that’s bumped up to 1440p and 60fps. Finally, if you’ve got splashed out on a shiny CPU and a new RTX 2080 Ti, you’ll be able to play Metro Exodus at 4K and 60fps. I treated myself to a new PC late last year, but unfortunately I talked myself out of getting an RTX because crikey they are expensive. So no extreme settings for me. What about you lot? Metro Exodus is due out on February 15.